… the grant will enable Excelencia to share with Single Stop’s constituents both tactical information about practical barriers that keep Latino students from existing support and services, as well as the positive impact of specific outreach and program strategies. This will involve community college leaders and student services professionals from leading institutions in up to seven key states, including Florida, California, New Mexico and Louisiana. This entry was posted in Uncategorized on October 18, 2012 by coronino. 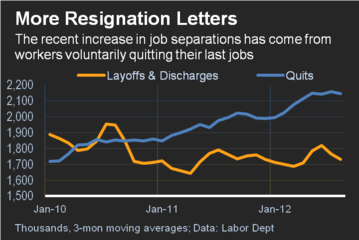 Despite the tough labor situation, are more employees are voluntarily quitting their jobs in pursuit of a better one? Perhaps. As the economy slowly recovers, I think those “holding” onto a job will be looking for greener pastures in the coming months. Finally, working from home is associated with higher levels of happiness and well-being (measured by Gallup surveys with a correlation of .50). This is not surprising since long commutes by car are one of those things that takes the biggest negative toll on our happiness. Like I said…. what a deal. This entry was posted in Uncategorized on October 16, 2012 by coronino. This is a great study by Georgetown University on the topic of “middle jobs.” These are jobs that require education and training beyond high school but less than a Bachelor’s degree, and secure middle-class earnings. According to the report, there are 29 million “middle jobs” in the United States that pay $35,000 or more on average and don’t require a Bachelor’s degree. In other words, these 29 million jobs might provide many with a ticket to the middle class. This entry was posted in Uncategorized on October 14, 2012 by coronino. I missed posting during most of Hispanic Heritage Month but….why celebrate only one month, right? Anyway, a couple good reads. The first via Diversity Inc. with lots of Hispanic data candy and articles related to Latinos. The second via National Journal introduces a new term, for me at least, for those teens or young adults who are not in school or working- “disconnected.” It’s an interesting read and study. Enjoy them both! This entry was posted in Uncategorized on October 12, 2012 by coronino. Hey Everyone! Apologies for the absence. I had a four week training recently that swallowed up most of my blogging time (not to mention a nagging 8 day cold!). Back to business now. While I was away, my new article on recruiting Latinos in the mobile age was just published in NSHMBA Magazine. The digital version should be out soon! Glad to be back! This entry was posted in Uncategorized on October 5, 2012 by coronino.